As flood recovery continues in Sonora, progress is being made in clearing away a dirty situation at the county park. Since September, piles of trash, mostly storm related, and rollaway containers have claimed a significant portion of the paved area at the county park now needed for parking during spring season sports events. Over the past weeks county workers have moved the mess to an area nearby and maintenance is underway to cleanup the parking lot just in time for fans attending ball games at the park. 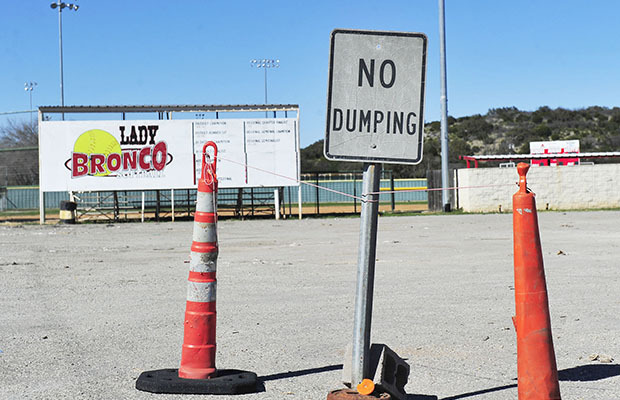 Sutton County Judge Steve Smith said county employees have been working diligently for the past two weeks to clear the dump site and ready the parking lot for traffic associated with softball and baseball games set to begin in a couple of weeks. 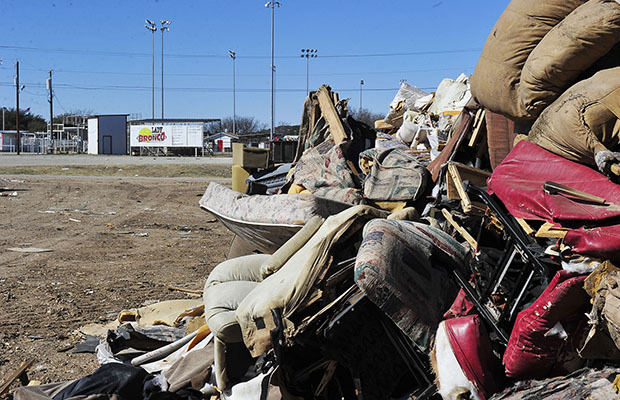 Trash including mattresses, appliances, clothing and personal belongings has been swept to an unpaved area behind the Dairy Queen – just a few feet away. Smith said the county is still accepting storm related trash, but it must be dumped in the designated area. Signs and cones have been placed to mark the area where dumping is no longer allowed. An extension granted by the Texas Commission on Environmental Quality (TCEQ) allows the county to continue to store storm related trash at the county park while disposal efforts continue. Since September, Republic Services, the contacted trash service provider for the City of Sonora, has doubled its production and removed twice the amount of trash out of Sonora. In addition to hauling garbage filled rollaways from the park daily, Republic has managed increased curb side trash pickup throughout the community. City Manager Ed Carrasco said the goal is to have all of the trash removed from the area within the next six weeks. Initially Republic absorbed the cost of hauling trash to area landfills to help with flood recovery expenses and ensure trash was removed quickly. However, the burden of cost is now upon the City at $42 per ton. There are still several tons of storm trash that has yet to be disposed. 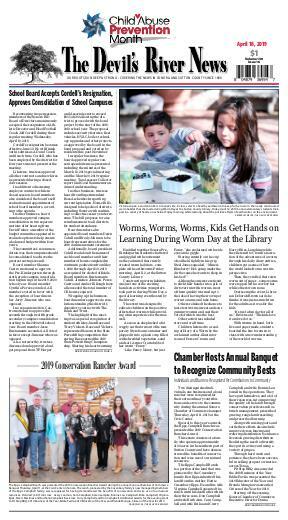 In the meantime, county and city officials continue to work together to get rid of the garbage and restore the county park in time for spring and summer activities. “Before the games start, that parking lot will be in fine condition,” Smith said.